WILL NOT FIX XI ALL WHEEL DRIVE MODELS - PLEASE SEE OUR FRONT MOUNT INTERCOOLER FOR THE XI MODELS Just as with our CAI, the STETT Performance Front Mount Intercooler was the first and still the best FMIC on the market today for the N54 and N55 135i/335i. The stock intercooler is barely efficient at stock boost levels under moderate driving conditions. Start cranking up the boost and you'll quickly realize how fast heat soak will, well, soak in. Not to be confused with the OEM style designs many manufacturers have, our FMIC is a true front mount intercooler (directly behind the bumper - in front of radiator). Capable of supporting over 620hp at only 80% of it's capacity, this cooler is one bad mama jama. 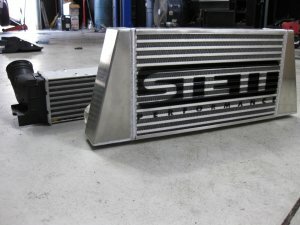 You'll have plenty of intercooler to support future power mods like turbo swaps and engine builds.. something a stock style cooler will fall short of. Rather than just build a cooler similar to the inefficient stock unit, we engineered our FMIC to take full advantage of the large opening of the factory bumper so that every bit of ambient air possible hits the surface of the cooler. We limited the thickness of the cooler to 3" to maximize ambient air penetration through the core. The thicker the core, the harder it is for air to penetrate which means you don't have an efficient heat exchange. By going taller and pushing the cooler to the front of the bumper, we expose more of the cooler to the incoming ambient air while the limited thickness allows that air to more effectively make it's way through the cooler for a more efficient heat exchange. We secure this behemoth with a proprietary mounting system that utilizes existing bolt holes so no drilling is necessary and there are not a bunch of brackets to assemble. Our patented mounting system is like NO other on the market. Each intercooler kit comes with everything you need for installation: Intercooler, patented mounting system with hardware, black powder coated 304 stainless steel piping, stainless t-bolt clamps and heavy duty silicone couplers. Will handle 620+HP at only 80% of it's capacity - Works great with turbo upgrades!